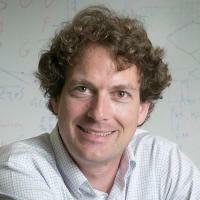 Volker Blum heads the "Ab initio materials simulations" group at Duke University. Dr. Blum's research focuses on "first-principles" computational materials science: using the fundamental laws of quantum mechanics to predict the properties of real materials from the atomic scale on upwards. Specific focus areas are interface and nanoscale systems with electronic and energy applications, as well as work on molecular structure and spectroscopy. Recent research topics include structure and properties of graphene on the semiconducting substrate, SiC; structure and electronic properties of new materials for photovoltaics; organic-inorganic hybrid materials; carbon-nitride materials for photocatalysis; and more. Dr. Blum is the coordinator of a major computer package for computational materials and molecular science based on electronic structure theory, FHI-aims. Work in his group is interdisciplinary (touching areas of physics and chemistry in addition to materials science), with opportunities for international collaboration and exchange. Active collaborations include groups in Berlin, Munich, London, Hefei, and elsewhere. Computational predictions and understanding of new materials related to energy and electronics, as well as molecular structure and spectroscopies, based on the "first principles" of quantum mechanics. Much of this work is directly connected to ongoing developments of new algorithms and computational tools in the all-electron electronic structure package "FHI-aims" and in the broader “ELSI” infrastructure, both led by Volker Blum. Sforzini, J; Nemec, L; Denig, T; Stadtmüller, B; Lee, T-L; Kumpf, C; Soubatch, S; Starke, U; Rinke, P; Blum, V; Bocquet, FC; Tautz, FS, Approaching truly freestanding graphene: the structure of hydrogen-intercalated graphene on 6H-SiC(0001)., Physical Review Letters, vol 114 no. 10 (2015) [10.1103/physrevlett.114.106804] [abs]. Schubert, F; Rossi, M; Baldauf, C; Pagel, K; Warnke, S; von Helden, G; Filsinger, F; Kupser, P; Meijer, G; Salwiczek, M; Koksch, B; Scheffler, M; Blum, V, Exploring the conformational preferences of 20-residue peptides in isolation: Ac-Ala19-Lys + H(+)vs. Ac-Lys-Ala19 + H(+) and the current reach of DFT., Physical Chemistry Chemical Physics : Pccp, vol 17 no. 11 (2015), pp. 7373-7385 [10.1039/c4cp05541a] [abs]. Schubert, F; Pagel, K; Rossi, M; Warnke, S; Salwiczek, M; Koksch, B; von Helden, G; Blum, V; Baldauf, C; Scheffler, M, Native like helices in a specially designed β peptide in the gas phase., Physical Chemistry Chemical Physics : Pccp, vol 17 no. 7 (2015), pp. 5376-5385 [10.1039/c4cp05216a] [abs]. Lau, VW-H; Mesch, MB; Duppel, V; Blum, V; Senker, J; Lotsch, BV, Low-molecular-weight carbon nitrides for solar hydrogen evolution., Journal of the American Chemical Society, vol 137 no. 3 (2015), pp. 1064-1072 [10.1021/ja511802c] [abs]. Knuth, F; Carbogno, C; Atalla, V; Blum, V; Scheffler, M, All-electron formalism for total energy strain derivatives and stress tensor components for numeric atom-centered orbitals, Computer Physics Communications, vol 190 (2015), pp. 33-50 [10.1016/j.cpc.2015.01.003] [abs]. Rossi, M; Chutia, S; Scheffler, M; Blum, V, Validation challenge of density-functional theory for peptides-example of Ac-Phe-Ala5-LysH(+)., J Phys Chem A, vol 118 no. 35 (2014), pp. 7349-7359 [10.1021/jp412055r] [abs]. Berger, D; Logsdail, AJ; Oberhofer, H; Farrow, MR; Catlow, CRA; Sherwood, P; Sokol, AA; Blum, V; Reuter, K, Embedded-cluster calculations in a numeric atomic orbital density-functional theory framework., The Journal of Chemical Physics, vol 141 no. 2 (2014) [10.1063/1.4885816] [abs]. Marek, A; Blum, V; Johanni, R; Havu, V; Lang, B; Auckenthaler, T; Heinecke, A; Bungartz, H-J; Lederer, H, The ELPA library: scalable parallel eigenvalue solutions for electronic structure theory and computational science., Journal of Physics. Condensed Matter : an Institute of Physics Journal, vol 26 no. 21 (2014) [10.1088/0953-8984/26/21/213201] [abs]. Nemec, L; Blum, V; Rinke, P; Scheffler, M, Thermodynamic equilibrium conditions of graphene films on SiC, Physical Review Letters, vol 111 (2013) [10.1103/PhysRevLett.111.065502] [abs]. Ren, X; Rinke, P; Blum, V; Wieferink, J; Tkatchenko, A; Sanfilippo, A; Reuter, K; Scheffler, M, Resolution-of-identity approach to Hartree-Fock, hybrid density functionals, RPA, MP2 and GW with numeric atom-centered orbital basis functions, New Journal of Physics, vol 14 (2012) [10.1088/1367-2630/14/5/053020] [abs]. Tkatchenko, A; Rossi, M; Blum, V; Ireta, J; Scheffler, M, Unraveling the stability of polypeptide helices: critical role of van der Waals interactions., Physical Review Letters, vol 106 no. 11 (2011) [10.1103/physrevlett.106.118102] [abs]. Auckenthaler, T; Blum, V; Bungartz, H-J; Huckle, T; Johanni, R; Krämer, L; Lang, B; Lederer, H; Willems, PR, Parallel solution of partial symmetric eigenvalue problems from electronic structure calculations, Parallel Computing, vol 37 (2011), pp. 783-794 [abs]. Blum, V; Gehrke, R; Hanke, F; Havu, P; Havu, V; Ren, X; Reuter, K; Scheffler, M, Ab initio molecular simulations with numeric atom-centered orbitals, Computer Physics Communications, vol 180 no. 11 (2009), pp. 2175-2196 [10.1016/j.cpc.2009.06.022] [abs]. Hart, GLW; Blum, V; Walorski, MJ; Zunger, A, Evolutionary approach for determining first-principles hamiltonians., Nature Materials, vol 4 no. 5 (2005), pp. 391-394 [10.1038/nmat1374] [abs].